It was in nineteenth-century Brittain that people first thought of turning swimming into a healthy form of recreational sport. Swimming pools were built, and clubs set up. In 1869 Brittain even acquired a special organisation to promote the interests of this form of activity, the Amateur Swimming Association. At the first modern Olympic Games, held in Athens in 1896, swimming was included in the competitive sports , a sign that it was by then fully established as a sport.Beach tourism developed in the same period. The advent of trains brought the coast within everyone”s reach. Not just the idle rich, but workers and their families could also afford to make enjoyable and invigorating trips to the seaside. The nineteenth century witnessed the creation of the first tidal pools, which took advantage of the shifting movements of low and high tide. At high tide the pools filled up or were totally flooded. At low tide they provided a sheltered environment for swimmers and seaside visitors. They became particularly popular in countries where the sea is too rough or too dangerous for swimming because of strong currents, jellyfish or sharks, as in South Africa and Australia. They were also created in places lacking in natural beaches, such as parts of Spain and Portugal. Tidal pools are the cradle of Australia”s love of swimming, but their precursors existed long before the country”s European colonisation. Many swimming pools were dug out at the sites of so-called bogey holes, a word deriving from the Aboriginal word bogey, meaning bathing.Australians are devoted to their tidal pools, in which many of them learned to swim as children. The strength of feeling on the subject came to the fore in 2009, when the city council of Newcastle in New South Wales announced plans to close the local Bogey Hole swimming pool, because it stood in the way of plans to boost the area”s development for tourism. This pool was built by convicts in 1819 to 1822; the then military commander of the city, Major James Thomas Morisset, had it dug out for his own use. In 1863 it was opened up for use by the general public. In the hundred and fifty years since then, it had grown into an important cultural icon of this region, in the words of a furious local resident. He compared the proposed closure to the Talibans bombing of two Buddhas in Afghanistan. In the face of the fierce protests, the city council backed down and decided to renovate the pool. Tidal pools may take on a wide variety of forms. In some cases, only a rough brick wall divides the swimming pool from the sea. In others, a simple concrete basin is sunk into the rocks. 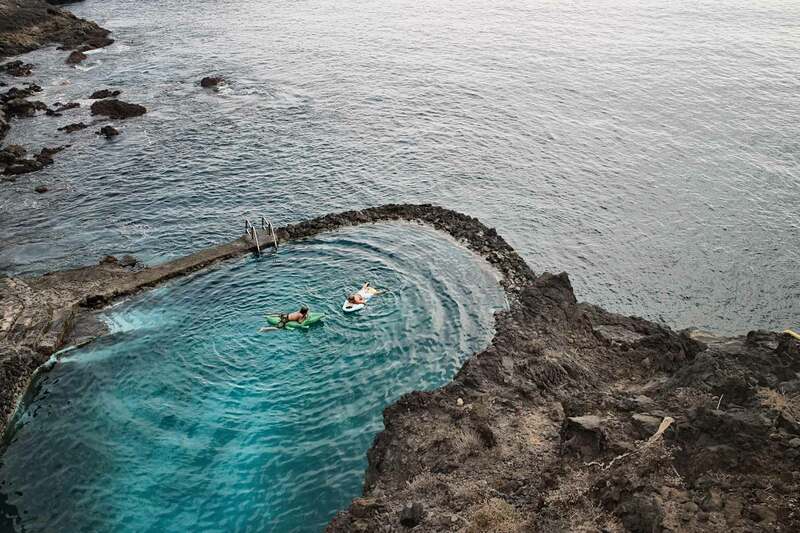 Some pools can only be reached by those willing to undertake a hazardous climb across rocks, and to descend roughly hewn steps flanked by rickety railings. They may harbour marine life such as starfish or even a small octopus, which nestle there after being washed up by the tide. Other tidal pools are much more upmarket and easier to reach. They may have extensive facilities such as changing rooms and showers, and some are even equipped with a drainage system. A few are used for swimming competitions, although the rising tide may propel waves over the side and push swimmers out of their lanes. Such mishaps are all part and parcel of the irresistible charm of tidal pools. Though tidal pools have been around for centuries, they are also perfectly in tune with modern views on the sustainable use of nature. The tidal movements make it unnecessary to use pumps or filters. A simple dividing wall protects vulnerable bathers such as children and inexperienced swimmers from the unpredictable motion of the sea, enabling them to feel safe, between land and water, high and low tide.